On December 13th we celebrated the opening of our first recycling plant in the States. This is one step further in our journey to revolutionize our supply chain and create more sustainable products both in the carpet flooring industry and in fashion. It was an amazing journey and many who were with us through it were in Phoenix for the inauguration to share stories and ideas as well as inspire the next steps. Here is a summary of those thoughts and some information on how we are closing the loop in carpet manufacturing. “I think Ray Anderson is smiling today,” said designer David Oakey of the deceased founder of Interface, a carpet flooring company, during the Grand Opening of our first carpet recycling facility. This is how our story starts. But for a moment, let’s go to the end of it. On December 13th, we all gathered to celebrate the opening of our first carpet recycling facility in Phoenix, Arizona. This is the latest step in Aquafil’s journey to revolutionize the supply chain of carpets and the production of nylon fibers for fashion garments. About twenty years ago, Aquafil started to develop a new unique regeneration system that allows Aquafil to produce nylon from waste instead of oil. Since then, the process has evolved. We started by using pre-consumer waste and then added post-consumer waste as well with spent carpets and used fishing nets. Old carpet waiting to be shredded at Aquafil’s carpet recycling facilityin Phoenix. At the beginning, we were sheering old carpets to recover only a small fraction of them to use in our process, but we still hadn’t maximized the potential of recycling carpets. The last step was to build a recycling facility that could recover not only the face fiber of carpets but all the components of the carpets to put them back into production. And this was what we did building Aquafil Carpet Recycling #1 in Phoenix, Arizona. Now, instead of sheering old carpets, we are shredding them and, via a process that involves water and friction, we are able to divide the carpets into their three main ingredients: nylon 6, that goes into our ECONYL® Regeneration System in Slovenia (EU), polypropylene that goes into injection molding, and calcium carbonate, used to stabilize the carpet, that goes into the road construction and concrete. In 2014, the carpet industry in the United States produced 11.7 billion square feet of carpet and rugs. Only two or three percent is recycled, and often the carpets are downcycled with the rest going to landfills or being incinerated. On stage, the President of Aquafil USA, Franco Rossi talked about how the history of carpet recycling is twenty years of trials and failure to break up a product which is built to last and not to be broken apart into its components. But we at Aquafil have done it! We relied up on our experience with the ECONYL® Regeneration process set up in Slovenia in 2011 and invested $25 million to invent the machines and the process to recycle the whole carpet. So why was Ray Anderson smiling on the day of the opening? Ray Anderson was the founder of the carpet flooring company Interface who, in 1996, declared that his company would become sustainable. Aquafil and its Chairman and CEO Giulio Bonazzi were among the first suppliers to respond to this calling by starting to develop our ECONYL® Regeneration System to turn waste into first-quality ECONYL® nylon that is 100% regenerated and regenerable. So that is why Ray Anderson was smiling. This was the last step of a long journey that at that time, as David Oakey said during his talk on stage, seemed impossible to many. But our story — with the opening of the ECONYL® Regeneration System in Slovenia first and then the carpet recycling facility in Phoenix — proved otherwise. Designer David Oakey was recalling the time when, working with Interface and Aquafil at the beginning, there were only 10 colors of yarn available in ECONYL® regenerated fiber, and they were trying to use all of them. Today we have 170 colors for carpet flooring, and we are working with 400 fashion brands and more than 60 carpet flooring customers all over the world. And the Phoenix facility is only the first one of this kind. Franco Rossi, President of Aquafil USA, announced on stage the opening of a second carpet recycling facility in Woodland, California, which is already underway. Each facility will recover 36 million pounds of old carpets each year otherwise destined for landfills and will retrieve their three main components: nylon 6, polypropylene and calcium carbonate. The nylon 6 in the form of pellets will be sent to the ECONYL® Regeneration System in Slovenia to feed the process together with other waste like fishing nets or textile scraps and make ECONYL® nylon for multiple uses. As Dr. Dayna Baumeister, Co-founder of Biomimicry 3.8. and also a speaker at the Phoenix event, said, “nature is not transforming a leave into a leave so why we should stop at transforming carpet into just carpet”. And this is why we say that there are endless possibilities to play with when using ECONYL® nylon. With the collaboration of designers, architects and our direct customers, we can transform waste into swimwear, carpets, jackets, rugs, jeans, backpacks but also sunglasses like the one of the Chilean brand Karűn who launched the new Pacific Collection just days before our opening in Phoenix. The glasses are the first one made with ECONYL® regenerated nylon and are part of a larger collaboration with Karűn to recover fishing nets in Patagonia with the help of local fishing communities. Thomas Kimber, founder of Karűn, was not on stage during the opening event but sent a message to inspire us all to look at the world in a different way through their sustainable glasses and their brand whose name means “to be in nature” in the Mapuche language (the indigenous culture of Chile). Another designer was on stage to talk about the journey they shared with Aquafil and the ECONYL® brand. It was John Moore, designer of the menswear brand Outerknown. He told the story of how three years ago, before even starting to design any garment, they went to Slovenia to see the ECONYL® Regeneration System and how fishing nets and other waste were transformed. In his talk, he mentioned a “four-stadium-sized building filled with waste material” where they could experience the incredible journey of circularity. He also recalled how the pattern for their first trunks was inspired by the fishing nets collected in Slovenia and how their first jacket from the Evolution series was one of the first to be created and is still part of their offering. Recently, Outerknown has launched, together with luxury brand Breitling, a watch that has the strap made with ECONYL® regenerated nylon. Currently, they are working on a women’s collection. Trunks by Outerknown with the design inspired by the ghost nets recovered and regenerated by the ECONYL® regeneration system. 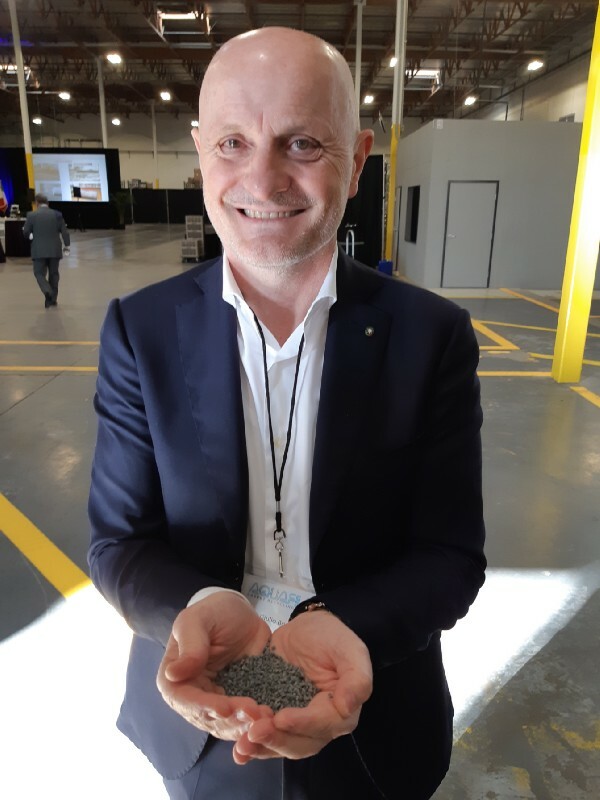 Giulio Bonazzi, Chairman and CEO of Aquafil with the first paletized fluff of Nylon 6 to be regenerated soon. “We can be a welcome species” said Dr. Dayna Baumeister, “if we learn from nature and work with networks of nutrients and different players to engage the larger ecosystem for the good of the planet.” We completely agree, and that is the road ahead.